Dhaka, March 9, 2014 (Alochonaa): An unconventional feature of the educational landscape in Bangladesh is the wide array of heterogeneous providers ranging from secular formal schooling to religious informal schooling. The four types of schools operating in the country over the last two decades have been government schools, privately managed secular schools, schools run by Non-Governmental Organizations (NGOs), and Madrasas (registered and non-registered Islamic religious schools). The presence of the different types of schools is not a startling fact given the astronomical number of school aged population in the country that stood at 41.5 million as of 2011 (BPHC, 2011). Broadly, the education system has been operationally categorized into two main sectors – primary education, managed by the Ministry of Primary and Mass Education, and post-primary education spanning all other levels from junior secondary to higher education under the administration of the Ministry of Education. 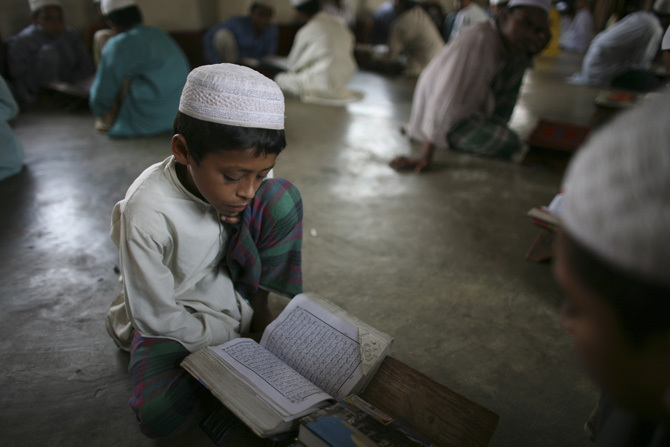 Unlike many other countries in the region with large Muslim populations , the educational system in Bangladesh constitutes of both state regulated private madrasas, known as Aliya madrasas, as well as independent private madrasas called Quomi madrasas. Majority of the registered madrasas in the former stream are state funded and operate under a unified state recognized Madrasa Education Board that regulates the curriculum content and the teacher training policy. Quomi madrasas, on the other hand, are privately run traditional madrasas that specialize in Islamic education and operate without any state support and recognition relying upon community support and donations from individuals. Besides having different sources of funding the two streams of madrasas differ in their overall structure. They are based on two distinct models that pursue goals of their own. While the Aliya madrasas impart secular general subjects alongside the teachings of Quran and Sunnah in an attempt to facilitate its graduates to integrate with the secular sector for higher studies and employment, the Quomi system narrows its focus on religious education with the aim of producing good Muslims with deep understanding of Islamic values and beliefs. The distribution of students enrolled in madrasas varies between levels – in the primary level where government and NGO schools are widespread and more accessible in the rural areas, the share of madrasa enrollment is 13.8 percent, of which 8.4 percent is accounted for by Aliya madrasas (Asadullah et al., 2009:5). In the secondary level, however, there were 1.77 million students enrolled in Aliya madrasas that made up for more than 30 percent of the state regulated secondary education as of 2007 (Bano, 2008: 6) and roughly 21 percent of the total (Asadullah et al., 2009: 5). These are few of the numerous anecdotal estimates of the number of madrasas and the total number of students enrolled in the system, owing to the source of educational data, BANBEIS, which lags in updating its database by 4-5 years (BEI, 2011). In particular, the figures for the Quomi stream of madrasas are more subjected to wild speculation due to their unregulated incidence. Apart from these two main types, few other categories of informal independent religious institutions have also been identified, mainly in the pre-primary sector, in negligible numbers. There are five different levels in the madrasa education system that can be aligned to the secular system of schooling. The primary madrasas form a substantial corpus of both the Aliya and Quomi streams and are referred to as Ebtedayee madrasas. This level comprises of five years of schooling in the Aliya stream covering Grades 1 to 5. From the secondary level onwards, the curriculum and pedagogies split into two for the two streams and the graduates from each stream are awarded with degrees from two separate bodies – the state recognized Bangladesh Madrasa Education Board (BMEB) for the Aliya stream and the Wafaq ul Madaris Al Arabia, an independent Board that certifies Quomi graduates. In the secondary level of Aliya madrasas, the first stage consisting of 5 years of schooling is called Dakhil, upon completion of which students appear for Dakhil examinations that is equivalent to the mainstream Secondary School Certificate (SSC). Subsequently, another two years of further schooling lead Aliya students to the Alim stage, the higher secondary equivalent of the mainstream system. On the other hand, the first stage of the secondary level in Quomi madrasas is called Mutawassitah and the second stage is known as Sanaria Ammah. In the final stage of the madrasa system there are four years in total; the first two years lead to a Fazil degree (Bachelors) followed by the Kamil degree (Masters) in the Aliya system whereas the corresponding levels in the Quomi stream are called Fazilat and Takhmilat respectively. The highest degree awarded to Quomi students is the Dawra which requires them to complete 16 years of schooling. Similar to the mainstream, the madrasa education system also forms a pyramidal structure with the number of students tapering off as the levels ascend. However, Bano (2008) points out that the reduction in enrolment in the tertiary stages of religious education has been found to be more dramatic than in the secular system which is believed to be due to the specialization in religious studies towards the final stage of education in the madrasas. In terms of geographical location madrasas are generally found concentrated in poor rural areas. In 2006, the Ministry of Education estimated that the percentage of madrasa students in rural areas was 89.55 percent against 10.45 percent in urban areas (Bano, 2008:8). The largest port city in the country, Chittagong, is interestingly the stronghold of Quomi madrasas and the hub for Islamic learning. The connection dates back to the early eighteenth century when Arab traders on the eastern routes would stop over at the Bengal coast (Bano, 2008). The gender composition of madrasas is an intriguing phenomenon when it comes to common notion regarding Muslim societies that are perceived to have reservations about female schooling. 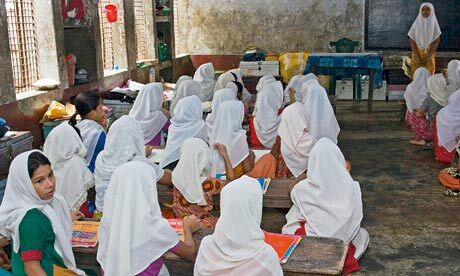 In addition to mixed madrasas, exclusively female madrasas are also on the rise in Bangladesh. Since 1998, there has been an increase of 35.8 percent in the proportion of female students enrolled in madrasas and as of 2002, female students accounted for as much as 44.4 percent of madrasa enrolment (BEI, 2011:20). The male to female ratio in the Aliya madrasas appears close to a balance in the post-primary level with 47.6 percent of those enrolled being girls against 52.4 percent of boys (Bano, 2008:7). Nevertheless, there still remains gap in the gender ratio between madrasas and secular schools in the post-primary level, where 50.6 percent of those enrolled are females, surpassing the percentage of males (Bano, 2008:7). Moving on to the higher levels of madrasa education the ratio of female enrolment tends to plummet – at the Alim level 48 percent of students are female, which decreases to 37.3 percent at the Fazil level and further drops to 17 percent at the highest level of Kamil (Bano, 2008:8). Female schooling under the Quomi system is mainly represented through female-only madrasas as there is virtually no account of co-educational Quomi madrasas in the country. It is estimated that only 12.5 percent of students enrolled within Quomi madrasas are females, approximating to 250,000 girls as opposed to nearly 1.5 million girls within the Aliya system (BEI, 2011:21). This is consistent with the ideological dissension between the Aliya and the Quomi madrasa streams where the former belongs to the more modern lineage of Islamic schools whereas the latter follows the traditional concept along the Deobandi line of thought. In order to construe the conceptual dichotomy and be able to analyze the current status of the two streams of madrasas inhabiting in the field of education in Bangladesh, one must take into account the historical evolution of the religious educational system in the sub-continent as well as the underlying factors that led to the independence of Bangladesh. In South Asia the establishment of madrasas goes back to the ascendency of the Delhi sultanate in the 13th century (Asaduallah, Chaudhury & Josh, 2009) although it is possible that some madrasas had been set up in the region prior to this period with the influx of Muslims from either the Middle East or Central Asia. Under the patronage of the Mughals these madrasas were institutions of religious as well as worldly learning, as a means to prepare elite graduates for serving the Mughal courts. Under the rule of Akbar, the educational system adopted an inclusive approach in which the emperor fostered the learning of additional courses that included medicine, agriculture, geography, as well texts from other languages and religions. Aurangzeb, who was a more conservative monarch, also encouraged the teaching of subjects that could be applied to administration (BEI, 2011). Molla Nizamuddin Firangi Mahal developed the Dars-e-Nizami under the patronage of Aurangzeb that was widely followed by madrasas in the Indian subcontinent. As contact with Persia increased, the Mughals adopted a liberal approach to the sciences that gradually replaced the more intolerant Ottoman manqul (revealed) education with the more relaxed maqul (rational) school. The pre-colonial Muslim rulers patronized innumerable madrasas and supported ‘Alims’ or ulemas to learn fiqh, history, sciences and archery in order to be effective administrators and jurists (BEI, 2011). With the demise of the Mughal Empire and the advent of the European powers the focus of the madrasas shifted to bare essentials like learning the Quran and Hadith. The prime concern of the British colonial power, upon taking over administration in 1857, was to institutionalize control over the whole of India[i]. India was in turmoil at the beginning of the nineteenth century with the British expanding their influence and control (Voll, 1994). The British Raj played an instrumental role in changing the orientation of madrasas in South Asia both directly and indirectly. To begin with, they severed one of the major sources of public finance, land-based revenues that was available to madrasas during the Mughal Empire, for the purpose of maximizing the revenues going to their coffers (Asadullah, Chaudhury & Josh, 2009). Consequently, madrasas became increasingly dependent on private sources of funds in the form of donations. In response to the disintegrating situation, Voll (1994) narrates that Muslims began to react with much vigor that shaped into fundamental militancy. While a number of activist groups raised the banner of holy war in the first half of the century, others supported programs of Islamic revivalism. One of the responses from the Muslim community came from Sir Syed Ahmed, who founded the Aligarh University on the basis of modern education for Muslims. The greater portion of the Islamic community differed from him as they believed modern education alone would lead Muslims astray. Another response was the embracing of the Dars-e-Nizami model developed by Molla Nizamuddin where the curriculum included Mathematics, Astronomy, Medicine, Logic, Geography, History, Chemistry, as well as Quran, Hadith, Jurisprudence and Sufism. The first Dars-e-Nizami madrasa was established under state patronage in Lucknow in 1906 with the name of Nadwatul Uloom, Lucknow. For tactical reasons the British ostensibly started patronizing a selected number of Dars-e-Nizami madrasas, and initiated the shift to the basics and reduced focus on scholarship. The Calcutta Aliya Madrasa was set up by Governor Warren Hastings of Bengal that changed the direction of madrasa education from all-round education to a truncated one, emphasizing on Muslim law and jurisprudence. In 1826, the English language was introduced in the madrasa curriculum and by 1910 the madrasa education was split into two streams of old and new schemes, where the new scheme included English, Bengali and Mathematics alongside Arabic studies (BEI, 2011). The point of departure in the new scheme was the rule that made English compulsory instead of Arabic and Farsi. In 1946, the Moazzem Uddin Hossain Committee reorganized the structure of madrasa laying the bedrocks for the current stream of Aliya madrasas in Bangladesh. The Calcutta Madrasa was eventually transferred to Dhaka, the capital city of Bangladesh today, with all its records, documents and furniture during the India-Pakistan partition in 1947. The most important intellectual force in the Muslim communities during the time was that of the great eighteenth-century thinker, Shah Wali Ullah, whose followers and descendants were the source of most of the dynamic developments that were materialized within Indian Islam at the beginning of the nineteenth century. In 1867, scholars who took inspiration from Shah Wali Ullah established an Islamic institution in Deoband with the aim of reviving a rigorous study of the traditional Islamic disciplines that they believed would link the Muslim community with their traditional identity. The basic concept was to produce a class of imams, ulemas, muftis, preachers and their likes who would hold Muslims to the core. The Darul Ulum of Deoband was relatively more conservative in accepting Hindu customs and fundamentalist in rejecting the law schools established by the colonial power. While they accepted the Dars-e-Nizami, greater emphasis was placed on revealed knowledge than the rational sciences. Another key feature of the Deobandi schools was their financial independence from the state as they relied only on private sources of funding in order to retain independence of activities and defy state intervention. Anecdotal evidences suggest that the Quomi madrasa system in Bangladesh is the offspring of this famous North Indian Deobandi madrasa. Upon partition of the Indian sub-continent, Pakistan and Bangladesh formed West and East Pakistan respectively on grounds of religion so they inherited a good number of Deobandi madrasas. West Pakistan was the natural destination for migration of the Ulemas trained under the Deobandi system because of language and geographical factors (Bano, 2008). In East Pakistan, on the other hand, the Quomi madrasas were founded by the Bengali students of Deoband and Nadwa on their return. Although the country was formed in the name of Islam the leadership was in secular hands whose endeavor was to build a more liberal Islamic society. Soon after the partition a language movement[ii] stirred up in East Pakistan in 1952 over the declaration of Urdu as the national language of both East and West Pakistan. This declaration was met with resentment from Bengalis because they would be at disadvantage when applying for government positions; the protest was effective in getting Bengali recognized as the second official language of Pakistan in 1946. The language movement is said to be the forerunner of the Bengali nationalist movement in 1971. The New Education Policy in 1970 was an attempt of reforming the madrasas by introducing modern subjects in the syllabus in order to endow madrasa graduates with the skills required to meet the demands of industrialization (Bano, 2008). However, the recommendations of this policy were not materialized in either East or West Pakistan due to the lack of political will. For a dominant group in East Pakistan ethnic and linguistic heritages preceded that of religious communal ties, which compounded with sociopolitical factors, ultimately led to the separation of the two states through the Liberation War in 1971. As the independence of Bangladesh was triggered by nationalist sentiments the overall perception towards madrasa education was not a very positive one and there were many in favor of abolishing the system. The secularist government of Sheikh Mujibur Rahman appointed a “Commission on National Education” that formed a special committee on religious education for suggesting reforms of madrasas. This committee was not sensitive to the historical and political aspects of the madrasa system and was highly critical of the outdated and reactionary nature of its curriculum. The aim of the committee was to gradually integrate madrasas into the mainstream education system and bring all forms of education under state control (BEI, 2011). However, the Awami League government was prevented from implementing any such policies after they elicited public opinion about the reform, in which the majority of the educated elites demanded the continuation of religious education in some form. Mujib’s government was displaced by the military regime of General Zia who chose to play the Islamic card to legitimize militancy (Bano, 2008). This provided a strong impetus for investment in Aliya madrasas and the establishment of the BMEB in 1978. An important step taken by the BMEB upon being functional in 1979 was the introduction of general courses in the Aliya madrasas with the inclusion of humanities and sciences at the Alim level. In 1980, the Board recognized the Alim degree as the equivant of the mainstream Higher Secondary Certificate and in 1985 Dakhil was given the equivalence of Secondary School Certificate. It was not until the 1990s, under General Ershad’s regime that the government offered any substantial incentives for madrasa reform. The first one was a part of the government’s overall policy for primary, secondary and higher secondary education systems in Bangladesh in the form of subvention of 80 percent of teachers’ salary, which was later scaled up to 90 percent (BEI, 2011:55). All state funded Aliya madrasas were eligible for this assistance but only private madrasas who agreed to register with the government under the program of Monthly Pay Order could claim the support. The second incentive, Food for Education, was introduced in 1993 and is believed to have contributed to the increase in enrolment and retention of students. Another gender-targeted incentive that reversed the gender ratio of the overall secondary education system was the female stipends for all girls irrespective of their household income conditional upon school enrolment and attendance. In summary, the Islamic education system in the sub-continent since its establishment has had significant structural and epistemological transformation that is to be noted for the assessment of its development. When looking through the lens of modernity it is imperative to take cognizance of the historical evolution and the political circumstances that led to its metamorphosis. As Voll (1994) suggested that any examination of Islam in the contemporary world must take into account the past experience if the present is to be understood. *Nusaybah is currently pursuing a masters degree on Education and International Development from Institute of Education, University of London. She has worked in the Education unit of the World Bank Office Dhaka for two years. Prior to that she was a Research Assistant at Bangladesh Institute of Development Studies after completing her first degree in Economics and Statistics from the University College London. She is interested in Education and Development.